And weeks. And months. The entire Southwest, in fact, has experienced one of the warmest, driest winters on record. For golfing and hiking and living the outdoor lifestyle, that’s great, of course. But, alas, there is an unsettling flip side to all this fair weather. That dark flip side is the possibility of an unprecedented lack of snowpack runoff in the Colorado River system. Forecasts are calling for a continuation of the dry weather into the fast-approaching spring. Winter – typically the Southwest’s season for accumulating snowpack in its mountain regions, which provides runoff into reservoirs like Lake Powell and Lake Mead – is nearing its end, regardless what groundhogs in Pennsylvania claim. Arizona Water News recently sat down with Tom Buschatzke, Director of the Arizona Department of Water Resources, to discuss the consequences of what may be a record-low amount of runoff into the Colorado River system from the 2017-2018 Winter snowpack. Arizona Water News: Director Buschatzke, there is a concern that the lack of snowpack in the western Rockies – particularly in the southern sectors of the Rockies – may result in an unregulated runoff into Lake Powell this spring that may be at a record low. How real is that possibility? Tom Buschatzke: Based on the current snow-water equivalent graphs, regarding that snow-water equivalent in the upper basin of the Colorado River where most of that water is generated is a very real possibility that the snow-water equivalent is tracking lower than 2002, which was the lowest year in recorded history for 100 years of records. We do know that the runoff is not linear to what the snow-water equivalent is showing, but it is pretty alarming that we are tracking at this point 2002, or actually a little bit below 2002. AWN: The Bureau of Reclamation has declared that there is almost no chance of a shortfall in water delivered from Lake Mead next year. But is there a chance that those predictions may change as a result of these extremely dry conditions in the Rockies? TB: Yes, there is certainly a chance that that that prediction, that forecast, may change. That forecast is based on a release from Lake Powell to Lake Mead of 9 million acre-feet. Normal release is 8.23 million acre-feet. If the unregulated inflow gets to a certain low level, that 9 million acre-feet release won’t occur. You will get 8.23 million acre-feet. That loss of volume of water (represents) close to 10 feet of elevation in Lake Mead. The Bureau of Reclamation’s current projection — with that 9 million acre-foot release — is about five feet above the shortage trigger, which means that if we get 8.23 (million acre-feet), we could be five feet below the shortage trigger. If we can’t conserve enough water in Lake Mead to make up the difference, that will be a high bar to achieve between mid-April and the end of July, which would be the time period in which we’d have to do that conservation. AWN: We’re not the only ones experiencing an abnormally dry winter. California’s snowpack in the Sierra Nevada also is very low right now too. How might that impact California’s stored water in Lake Mead? TB: If the snowpack in the Sierra Nevada continues to be also very low and the allocations of the State Water Project remain very low, that means southern California is going to get much less water from northern California than it normally does. It also means that they will be looking to make up the difference somehow, and they will be looking probably at the Colorado River to make up that difference. Potentially, some of that water stored by California – by the Metropolitan Water District (of Southern California), particularly – that is stored in Lake Mead might start coming out of Lake Mead. There is about 500,000 acre-feet of that water stored. That is over six feet of water under the regulations that control water going in and water going out of Lake Mead. California can take 400,000 acre-feet – or five feet of water (off the top of Lake Mead) – in this calendar year. So, that is a potential that plays into the possibility that the prediction made by Reclamation so far might also change. AWN: How does the unusually dry winter affect the discussion among the Colorado River states regarding a Drought Contingency Plan? 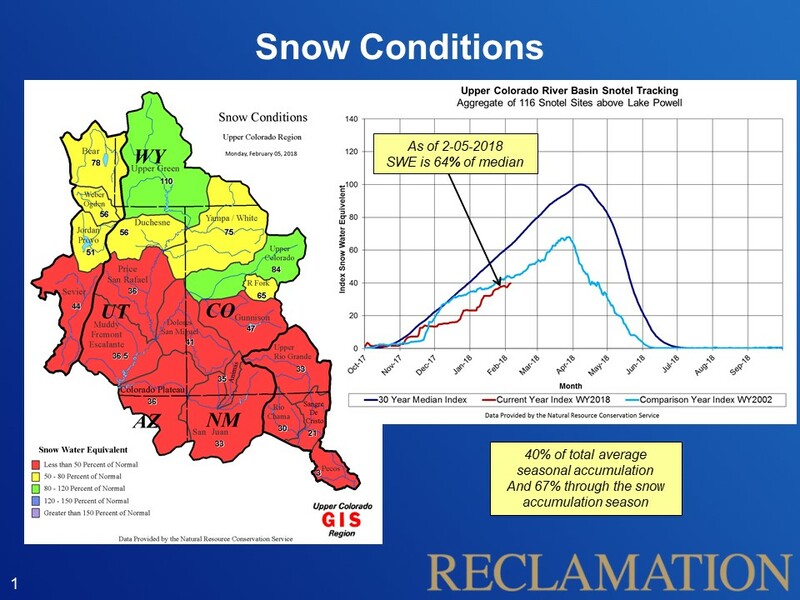 Many Colorado River stakeholders felt that last winter’s higher-than-average snowpack created a so-called “comfort zone” regarding finalizing a DCP. Can they remain comfortable about water in the Colorado now? TB: So, I think between the states — the state folks who worked on that Drought Contingency Plan – we are in agreement that we need to finalize that Plan. Some of the individual stakeholders, water-users, etc. that may have believed that there is a “comfort zone,” that we have bought time to further work on the Drought Contingency Plan, I think, need to really address what is happening with the hydrology and the increasing risks of not just the short-term impacts on Lake Mead, but potentially going into a shortage in 2019. (They need to address the fact that) this bad hydrology also has implications for the future and for the lake falling to those critical elevations that the Drought Contingency Plan was intended to protect. So, they should not be comfortable about water in the Colorado River. We need to continue to work to finalize the Drought Contingency Plan. And we need to make sure that in Arizona we have the tools in place to make that happen. Arizona Department of Water Resources Director Tom Buschatzke will testify on Wednesday, Dec. 6, before the Senate Indian Affairs Committee on legislation that would provide the Hualapai Tribe of northwestern Arizona with 4,000 acre-feet of Colorado River water annually. In 2016, the Tribe agreed to a settlement of its long-standing claim to Colorado River water. The legislation – S. 1770, introduced by Arizona Sens. Jeff Flake and John McCain — secures the 2016 agreement. The agreement ensures that the tribe’s previously outstanding water claims could not potentially displace water used by other customers that also rely on the Colorado and Verde rivers. As a result, the agreement helps provide certainty for water users throughout Arizona. In addition to its claim to Colorado River water, the Tribe also has a claim to water of the Upper Verde River watershed. “The resolution of the Hualapai Tribe’s water-rights claims, including its claims to Colorado River water, is a major step to providing long-term certainty to water-users throughout the State,” said Buschatzke. The Senate Indian Affairs Committee hearing on the proposed legislation — known as the Hualapai Tribe Water Rights Settlement Act — is scheduled for 12:30 p.m. (MST). Central Arizona Project and the federal Bureau of Reclamation reached an historic agreement on Thursday that allows for “new and innovative” uses of the CAP’s 336-mile system of canals, including transporting new water supplies, exchanging supplies among users and efficiently accessing water stored underground by the Arizona Water Banking Authority and others. The agreement creates a legal framework for a variety of water supplies to be moved through the system, including many dedicated to addressing possible future shortfalls in Arizona’s Colorado River water allocations. “It allows for flexibility in managing our Colorado River water supplies,” said Tom Buschatzke, director of the Arizona Department of Water Resources. Until now, so-called “non-CAP water” – that is, water controlled by users other than the Central Arizona Project – flowed through the elaborate delivery system only on an ad hoc basis. In 2014, for example, the cities of Phoenix and Tucson reached an agreement allowing Phoenix to store some of its unused Colorado River allocation in Tucson-area aquifers. Thursday’s agreement provides a legal framework for such water exchanges, thus opening the door for further innovation, as well as for future agreements on water quality and financial issues. “This agreement provides us with the flexibility for cost-effective recovery of stored water, including more than four million acre-feet of CAP water stored in the aquifers of central and southern Arizona,” said Cooke. Water Resources Director Buschatzke joined Cooke in extending thanks to the Arizona congressional delegation – especially noting the efforts of Arizona Senator Jeff Flake – for helping make the system use agreement happen. “Our role was to support efforts to complete the system use agreement for the benefit of Arizona water users,” added Buschatzke. Gov. Doug Ducey expressed thanks to former Interior Secretary Sally Jewell for her efforts in support of the system-use agreement. The CAP canal system was built by the federal Bureau of Reclamation for the state of Arizona and is managed and operated by the Central Arizona Project. The deal is especially valuable to the Water Bank, which pays to bring Colorado River water through the CAP system into central and southern Arizona. The Water Bank stores that water in underground aquifers, or directly recharges it into underground storage facilities. It also arranges for water deliveries to irrigation districts, which use the water in lieu of mined groundwater. Water Bank officials helped review the agreement. The deal creates a legal framework allowing the Water Bank to use the CAP system to make recovered water available during potential periods of shortage of Colorado River water deliveries to Arizona. Until now, the Water Bank’s capacity to make use of the water it stores has been extremely limited. CRWUA meetings, Las Vegas — The members of the Colorado River Water Users Association may have parted ways last week disappointed that the Colorado River Basin states and the federal government were unable to finalize negotiations to protect the river system from drought. But they still managed to finish their meetings on a high note, including encouragement from Secretary of Interior Sally Jewell to continue negotiating. “We want to get as far as we possibly can, and that’s what we’re going to be urging everybody to do,” Jewell said to reporters at the CRWUA meetings on Thursday. Many of the negotiators themselves reaffirmed their commitment to getting a drought-contingency plan done soon, if not before the change of administration in Washington, D.C.
Also on Thursday afternoon, Secretary Jewell officially signed a decision for managing the Glen Canyon Dam over the next 20 years, a deal that significantly updates environmental considerations in the dam’s operation. Known as the Long-term Experimental and Management Plan (or, LTEMP), the plan is consistent with the federal Grand Canyon Protection Act of 1992 and represents two decades of study of the dam and its impacts on downstream resources. The Act required the Secretary of Interior to operate Glen Canyon Dam in such a manner as to protect and mitigate adverse effects and improve the values for which Grand Canyon and Glen Canyon were established, which provided the basis for the new management plan signed by Secretary Jewell. The out-going Interior Secretary signed the Record of Decision approving the management plan shortly before the end of the annual CRWUA meetings in Las Vegas. Secretary Jewell also expressed optimism that an agreement to protect Lake Mead and the rest of the Colorado River system, as well as a separately negotiated river-system agreement with the Republic of Mexico, should be forthcoming soon. “We have an agreement that is pending with Mexico that we need to get across the finish line in order to address our water needs between the two countries… and that has to take first priority,” she said to reporters. In a letter to Jewell sent in November, representatives of Arizona and the other six Colorado River basin states voiced their qualified approval of the LTEMP.